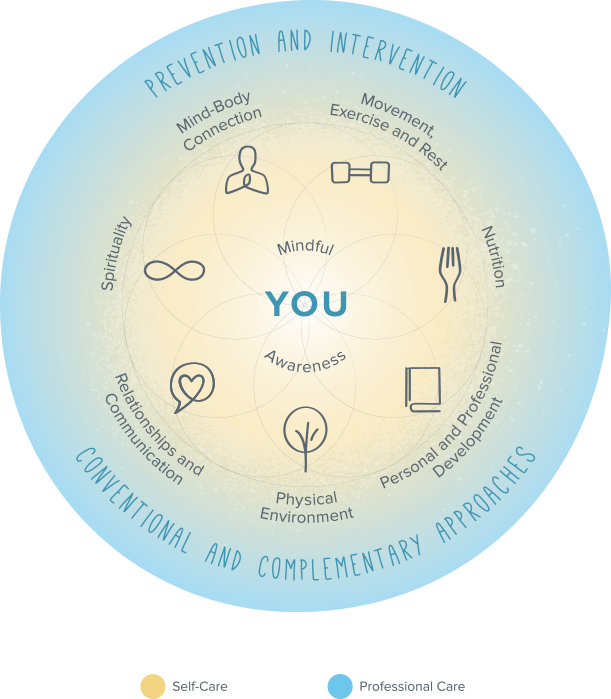 The wheel of health uses a three ring approach to illustrate areas of health and well being. This process starts in the center with YOU who drives this health coaching process. Your values, goals and priorities are most important in planning for personal health. The first ring is Mindful Awareness. Mindful awareness means paying attention on purpose with curiosity, an open heart and an open mind. This permits clear and thoughtful choices to maintain and strengthen areas of success in wellness. The outer ring encompasses Professional Care. This area includes conventional medical intervention and prevention as well as complementary approaches to healthcare. Integrative Health Coaching works to seamlessly integrate all of these elements. This creates a new model for healthcare in which clients and caregivers work together to identify and implement effective approaches to achieve optimal health and wellness. Adapted from Duke Integrative Health Coach Professional Training, Duke Integrative Medicine. © 2015, Spot on Health and Wellness, LLC. All rights reserved.